Principle 4 — Dominate: God gave us dominion over the earth, you are to dominate it! Principle 5 — Release: It’s time to release what God has put inside you so it can produce Income for u, that you lack nothing! Principle 7 — Receive: Receive the increase God has commanded over your life, get comfortable receiving. Just to thank you for ordering at 12pm, I going to give you some Amazing Surprise Bonus gifts valued at over $300. 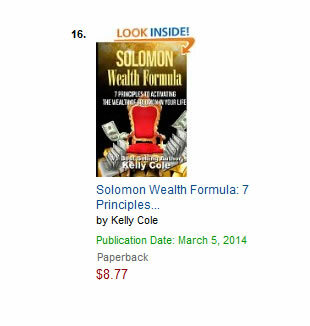 The Solomon Wealth Formula is a word the Lord gave me while studying my Sunday school lesson to teach my class. I wanted to share some type of inspiration with my students that would motivate them to do something different in the New Year. I wanted them to actually look at their lives and ask themselves, I’m I really living the abundant life God said I could live? If they answered no to that question, I then asked them why not? Have you buried your talent, have you dismissed your gift God has given you? While searching my spirit and the word of God for the answer and or a solution I could share with them the Lord dropped in my spirit Solomon. The scripture that came to mind was 1 Kings 4:34. The reason that scripture came to me was I remembered that all the people that came to hear Solomon’s wisdom, they didn’t come empty handed they brought him a gift of some kind. Now let’s relate that to today’s time. The people paid Solomon to consult them on what they needed help with or what they needed an understanding about. So I wrote down to share with my class that one of Solomon’s income streams was he did consulting! So I completed my notes and thought I had my lesson together, I would just ask them what specialized knowledge they had, then enlighten them on the fact that they could charge people to consult them. Just as I was about to close my bible the Lord said read the whole chapter of 1 Kings 4, the Lord showed me in 1 Kings 4 exactly what Solomon did to create his great wealth, how he did and how I could apply the same wealth principles to my life. Today I’m going to Share with you The First 2 Principles! Finally, Your Limited Time Insider Access To A-Lister Music Executives Has Been Granted! "Generating Ideas and Making Dreams Come True!"